Our experts will help you design a beautiful outdoor living space that's perfect for your home. Once you decide to add a deck to your home, the next challenge is finding the right design. Fence & Deck Depot has years of experience designing and building all types of decks, and we can help you get the perfect deck for your needs. If you're interested in a backyard deck or pool deck, call us today at 1-844-385-8757 or contact us online to learn more. We offer free estimates on all of our work in St. Charles, St. Louis, O'Fallon and the nearby areas in Missouri & Illinois. Get a Free Deck Design Quote Today! Size: This may seem obvious, but it's an important first step. Do you want your deck to run the length of your home or just part of it? How high off the ground does it need to be? Factors like these help determine materials and cost. Access: Depending on the style of your deck and your individual needs, you can choose from individual staircases, wraparound stairs, and ramps. It's also important to determine how many doors to the inside of the home are needed. 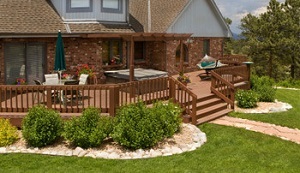 Landscaping features: A deck should be part of your overall backyard design, and existing features must be considered. The deck should fit seamlessly around gardens, ponds, and other landscaping features. Additionally, spaces for a grill, a hot tub, or other additions are key to any design. Pool decks: Depending on your local building code, a pool deck will need railings of a certain height and gates that lock. We can help you ensure your pool deck looks great while meeting all necessary requirements. Material: There are several different options for deck materials, with each having different benefits and cost. We will help you determine what's right for your home and your design plan. Call your local experts for deck design today! If you're ready to upgrade your outdoor living space with a new deck, Fence & Deck Depot is here to help. Our complete deck design and installation services will ensure that you get the perfect deck for your home. Call us today at 1-844-385-8757 or contact us online to get started on your deck design process. We offer free estimates on all our work in O'Fallon, St. Charles, St. Louis, Chesterfield, St. Peters, O'Fallon, Florissant, Wentzville, Belleville, Ballwin and throughout the surrounding areas. Get a FREE Deck Design Quote Now!